We’d love your help. Let us know what’s wrong with this preview of My Lovely Wife in the Psych Ward by Mark Lukach. Mark and Giulia’s life together began as a storybook romance. They fell in love at eighteen, married at twenty-four, and were living their dream life in San Francisco. When Giulia was twenty-seven, she suffered a terrifying and unexpected psychotic b A heart-wrenching, yet hopeful, memoir of a young marriage that is redefined by mental illness and affirms the power of love. To ask other readers questions about My Lovely Wife in the Psych Ward, please sign up. Is this book good when compared with actual fiction? In my experience, people tend to heavily overrate stories that are based on real life events, as if being real made them better stories, wich i dont believe so. Is this book actually well written, or is the realness of the story the main selling point? Could a high schooler read this book? In the past I've dealt with my own mental health issues, mainly after developing a thyroid disorder and after having children. It isn't easy and in my opinion isn't taken seriously enough. Many medical professionals are less than compassionate and often times family members look at it as a weakness and feeling that it's crippling to their own lives as if the actual person with the disease chooses to be ill. The mentally affected person's life stops, while everyone else expects to move on with th In the past I've dealt with my own mental health issues, mainly after developing a thyroid disorder and after having children. It isn't easy and in my opinion isn't taken seriously enough. Many medical professionals are less than compassionate and often times family members look at it as a weakness and feeling that it's crippling to their own lives as if the actual person with the disease chooses to be ill. The mentally affected person's life stops, while everyone else expects to move on with their own. With that said, I had mixed feelings about this memoir and possibly because it's one sided, from the caregivers perspective. Although, I personally have never been in Mark's shoes and haven't had to deal with a person with a disorder like Giulia is experiencing. My Lovely Wife in the Psych Ward is a memoir written by a husband who is dealing with mental illness for the first time. Early in his marriage his wife suddenly develops a mental disorder originally diagnosed as Schizophrenia but later re-diagnosed as Bipolar disorder. She spends about a month in a hospital while doctors try to figure out what's wrong. During this time, her husband Mark is dealing with a range of emotions including sadness, confusion, anger and many more. As Giulia is started on medications, everything is up in the air and Mark is left to wonder what their future holds. Parts of this memoir were hard to read, while others were heartwarming. You can feel the love that Mark has for Giulia, but as anger sets in, things begin to change for their relationship--he begins to resent her as time moves on from her first hospitalization. This is where I began to have some mixed feelings. There were events taking place in the relationship where they were falling away from each other and everything became uncertain. Was he giving up? It almost seemed as though Mark was becoming more distracted and couldn't deal with it anymore. Again, I can't imagine how hard it must have been for him and certainly can't judge, but it seemed like he just wasn't understanding that the illness wasn't Giulia's fault. She had no way to stop it and she was very scared as well. With their mutual decision to have a child (Jona), things became more complicated and even with the overwhelming support of both wonderful families (which I thought was amazing), it wasn't enough. Giulia would be dealing with a lifelong illness which could potentially affect everyone in her life. I thought the book was written very well. I was engrossed from cover to cover and I'm glad to have read it. I commend Mark for the courage to tell their story and the strength to hang on through all the ups and downs. I hope that as time moves on, Giulia's illness will improve, and Mark and Giulia can enjoy their marriage and child. I was bored with Giulia who was either psychotic (not in interesting ways as in described in Operators and Things: The Inner Life of a Schizophrenic), depressed or slightly manic. She was only described in terms of illness or wellness. Everything she did was together with her husband, she seemed to be a strong personality not a weak person, but other than being assertive (nasty) when she was sick, and a not-very-involved mother I don't know who she was. The father, the author, probably wasn't quite the wimp he made himself out to be. He very much wanted to be a house-husband and main carer of his son, but was unable to be and had to have his mother or mother-in-law (whom he called Suoc as a pet-name derived from the Italian for MIL) to help do the laundry, cooking and other household chores even before he and his wife had a child. She annoyed him by "ironing his boxer" ie interfering around the house, but what did he expect, she didn't have much to do but keep house for two adults and visit her sectioned daughter? When he and his wife have a child, during one of her periods of stability, he immediately becomes a house-husband and main carer of the little boy. When his wife has to go hospital during two more psychotic breaks, he has to have his mother or "Suoc" come to help out. His mother has to fly in from Japan to San Francisco to do her turn! Why is it that so many women look after kids by themselves but so many men need help? I was a single mother but my ex needed the help of his sisters with the kids. Neither he nor they could envisage he could actually manage the house and the children and get them off to school in clean clothes with lunch before going to work All By Himself. The author, Mark, was emotionally unstable because it was so difficult to adjust to either visiting his wife in hospital or caring for her at home. His only real hobby seems to have been surfing. Again not a rounded character. If I met either Mark or Giulia for coffee I wouldn't know what they looked like other than she is dark and has glasses, nor what I know what to say beyond 'How are you?" which in the circumstances might be a leading and unwelcome question. So what I got from the book is that if you love someone with a lifelong psychosis that might flare up at any time (or might not, ever again) you have to be prepared to adjust your life to living around it and hope that one of you when either well or not needed for caring duties, can get jobs with good medical insurance and high pay so that when times are bad, at least financially you are ok.
AT SOME POINT ....not too far into this memoir....I COULD NO LONGER PULL MYSELF AWAY. It’s GUT WRENCHING....on so many different levels. It’s not only an inside look at the onset of a psychotic breakdown- a full blown breakdown- the realities of suffering - ( frustration- fear - grief- anger- resentments - remorse- hopelessness- etc. on the caretaker), but this book exposes imperfections - complications- and limitations with mental health care hospitalization itself. I was cringing several times: for example when it was ‘clear’ that Giulia needed to be hospitalized ( each time was the ‘same’ story) - she had to wait until they found a hospital where there was an opening for her. Kaiser Hospital in SF doesn’t have their own psyche ward- so they must use other hospitals in the Bay Area. One of the hospitals was over an hour drive away. I FELT ANGRY WITH MARK- Giulia’s husband. He loved his wife - wanted to visit her ( only an hour a day during visiting hours) - but his drive was longer each way. Plus he had to find childcare for his young son ‘under’ the age of a year. VERY STRESSFUL daily life!!! Plus, the real worry and concern that his relationship of love and equal compassion would never be the same. HIS LIFE WAS OVER AS IT ONCE WAS. There were so many trial and errors with medication - and proper diagnosis. In the meantime - Mark couldn’t find out what was happening to his wife ‘unless’ she signed papers saying he had permission. Like I said earlier: This memoir is GUT WRENCHING ON *MANY* LEVELS........(but our awareness and compassion expands from reading it). THIS BOOK MAKES YOU THINK ABOUT HAVING A GOOD HONEST CONVERSATION WITH YOUR OWN SPOUSE— for ANY needed lengthy hospitalization- ( not ‘just’ mental illness).... YEARS AHEAD OF A NEED! - preventative talks! ......The book ‘cover’ almost kept me from reading this book. It’s too romantic looking at first glance. I’m not sure what ‘would’ represent this story better— but the book ‘cover’ isn’t balance accurately in my opinion.....being a little too rosy looking. This story is everything ‘but’ rosy. .......My heart broke for Mark: husband, caretaker, father, dog owner, freelance writer, history teacher, fitness-athlete-guy. but then I felt bad: I know she was sick. ITS HARD TO LIKE SICK PEOPLE WHO GET MEAN WHEN SICK. Her illness had a life of its own. Nobody would choose to live with a mental illness - so yes- my heart goes out to her too. AND.....Giulia wasn’t always a mean-disease-machine. .......Both sets of parents of Mark and Giulia were inspiring people to me. Supportive without being demanding and crossing boundaries. Great role models for in-laws. .........There are lovely moments in this story too: not every moment is bleak. MARK & GIULIA - remind us of the couple next door - wholesome - committed to their relationship - value family - their jobs - their shared love of travel - the beach - biking - soccer - surfing the gym- aerobic classes together — running- taking turns cooking and doing the dishes - playing with their dog- the incredible happiness in the birth of their son. NOT ‘EXTREME’ FINANCIAL STRESS ( at least it didn’t seem to me)—-was a helpful. The lives of Mark and Giulia will never be fully secure in knowing that ‘another’ psychotic breakdown could be around the corner again for Giulia. Bless this couple - this family. Real - raw - intimate - page turning - and a terrific contribution. My Lovely Wife in the Psych Ward gave me a different perspective that I have been searching for, the perspective of a caregiver of a loved one with a mental illness. Some understanding that as caregivers I am not alone in the feeling of being overwhelmed, exhausted, and frighten. Mark Lukach also gave me some understanding that maybe we can't beat mental illness but we can learn to live with it. I highly recommend this beautiful, raw, honest, and hopeful memoir to caregivers of loved ones with a My Lovely Wife in the Psych Ward gave me a different perspective that I have been searching for, the perspective of a caregiver of a loved one with a mental illness. Some understanding that as caregivers I am not alone in the feeling of being overwhelmed, exhausted, and frighten. Mark Lukach also gave me some understanding that maybe we can't beat mental illness but we can learn to live with it. I highly recommend this beautiful, raw, honest, and hopeful memoir to caregivers of loved ones with a mental illness or for anyone wanting to understand what it is like for a caregiver of someone with a mental illness. I wanted to like this book. I really, really did. Don't get me wrong -- Giulia's rapid descent into her first psychotic break grabbed my attention right away, and it was both horrifying and amazing to read about the rapidity with which her illness manifested itself. But as the book wore on, while my sympathy for Giulia remained, my sympathy for her husband Mark -- the author of the book -- dissipated like the fog he so often references in the book. Don't get me wrong -- I kno I wanted to like this book. I really, really did. Don't get me wrong -- I know that mental illness affects more than just the person directly experiencing it; it affects the whole family -- but honestly, after a while I felt like Mark was enjoying playing the martyr, like *he* was the only one whose life was being upended by his wife's mental illness. By the time I reached the end of the book, I wished that I could shake him by the shoulders and yell into his face, "YOU ARE NOT THE ONLY PERSON IN THIS FAMILY. STOP TRYING TO MAKE YOURSELF INTO A DAMN MARTYR." I read a lot of memoirs -- and I mean a *lot* -- but this one just made me angry. It made me feel like the author was trying to make everything about him, rather than his wife. Even the title grated on my nerves for some reason; I'm not sure why, there was just something about the absolute bluntness of it that set my teeth on edge. "My Lovely Wife in the Psych Ward"? Why not just call it "My Wife's Really Hot But She's Mad as a Hatter"? Honest to God. I just feel very ambivalent about memoirs written about peoples' spouses. I haven't had this level of distaste for a memoir since "Wondering Who You Are" by the insufferable Sonia Lea. I received a copy of this book in a Goodreads giveaway. Books about mental illness often irk me. Now, that's not because I think mental illness makes a person bad; nobody with mental health problems should ever be ashamed of it and there should be more support out there for those afflicted with it as well as their family and friends. But just because a person is a "survivor" of mental illness, does not entitle them to some sort of martyr status. To be fair, this book didn't wallow completely on t I received a copy of this book in a Goodreads giveaway. Books about mental illness often irk me. Now, that's not because I think mental illness makes a person bad; nobody with mental health problems should ever be ashamed of it and there should be more support out there for those afflicted with it as well as their family and friends. But just because a person is a "survivor" of mental illness, does not entitle them to some sort of martyr status. To be fair, this book didn't wallow completely on the subject of mental health. The author paints some very heartfelt scenes of love, joy and friendship, and his unconditional support for his wife is most certainly admirable... but a whole book focused on mental illness? I don't entirely know why, but something about it bothered me. This is one of those books where a person ends up defined by whatever illness they happen to have, so that instead of getting to know his wife as a person, we get to know her as a label. This makes it very difficult to relate to her as she was described throughout. - Mobb Deep, "Shook Ones Pt. II"
I'm trying to deflect how much this book affected me by starting off with a hip hop lyric, but it's actually the most appropriate way to review this book for me. It scared me. I've been incredibly fortunate in my life in many ways. I am the product of unbelievable privilege. I have never had to deal with mental health in any substantial way, personally or amongst the people I care about. For that reason, the idea of a psychotic break (like the ones detailed in this book) is terrifying to me, even as I try to grapple with realizing the stigma I'm attaching to the issue. But this is truly the stuff of nightmares. Mark Lukach and his wife Giulia deserve a mountain of credit for being so open and honest in the depiction of their relationship through some incredibly trying times. Neither of them come off as saints, and the book is at it's strongest when they detail the raw and real difficulties this condition imposed on them, even in the good times. That being said, some of their privilege makes mine look positively pauperish by comparison, and the fact that it's never really acknowledged in a meaningful way leaves a bad taste in my mouth. From the first page you get a deep sense that Giulia and Mark, are in a very loving relationship. When she gets a new job she doubts herself and isolates herself from Mark. This is the first chink in their relationship!! I really felt for Mark having to watch the one you love slide into despair and not being able to help is soul destroying. This book beautifully dealt with mental health and the battles it entails. There is no quick fix, you have to learn how to individually deal with it as every situation is different. This book will stay with me long after reading it, poignant and thought provoking!! Thank you to netgalley for my copy In exchange for a review. 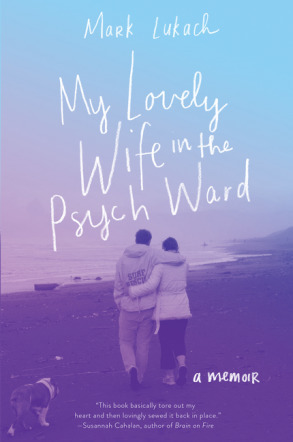 I am a sucker for love stories, and “My Lovely Wife in the Psych Ward” was no exception. As an aspiring allied health professional, memoirs about mental health and mental illness are invaluable to me. Sure, in school we learn about psychopathology, but we rarely cover the human side of mental disorders. Who is the person behind the diagnosis? What are they like outside the hospital walls? This year, I read some astounding memoirs by patients and medical professionals. But this was my first tim I am a sucker for love stories, and “My Lovely Wife in the Psych Ward” was no exception. As an aspiring allied health professional, memoirs about mental health and mental illness are invaluable to me. Sure, in school we learn about psychopathology, but we rarely cover the human side of mental disorders. Who is the person behind the diagnosis? What are they like outside the hospital walls? This year, I read some astounding memoirs by patients and medical professionals. But this was my first time reading about mental illness from a caregiver’s perspective. It made me realize how important books like this are. Illness is cruel. It does not just impact the patient. Illness carries with it a ripple effect. Mark met Julia when he was just 18-years-old. He fell in love with her right away. Julia was impeccable - ambitious, stunning, and outgoing. He realized life was not perfect, but his time with Julia came pretty darn close to perfection. But everything changed after Julia had a psychotic breakdown. She started experiencing delusions, paranoia, and auditory hallucinations. They thought it was a temporary event. Little did they know this one episode would change their marriage forever. As Julia’s condition worsened, Mark sticks by her side through the ups and downs, sickness and health. Mark narrates this story with relentless vulnerability. He does not romanticize or sugarcoat the reality of being a caregiver. It is a tough job. Taking care of his wife was overwhelming, exhausting, and frustrating. He had to leave his teaching job, sacrifice sleep, and delay plans to have children. Instead, his time became occupied with his Julia’s illness. Keeping track of her medication regime, hospital visits, and suicide attempts were his top priority. He felt helpless. Here was a person he loved who was disappearing under the wrath of an illness he had no control over. He understood none of this was Julia’s fault, but he detested the illness for changing their marriage. Unlike most professionals, when you love someone, you see them without a medical gaze. You see them for who they are. You can create a separation between them and the illness. And because Mark could see Julia for who she is, he persisted. Despite her psychotic episodes, he did not leave Julia’s side. I am a book snob. I admit it. I rip apart verbage, punctuation, pace, character arcs, you name it. I am critical. I give this book five stars without batting an eye. I don't think people can possibly recognize how personally terrifying Mark's level of candor and transparency is. The courage it took for both him and Giulia to agree on publishing his memoir is staggering. Mark's wife, Giulia, has her first psychotic break shortly after they are married. He shares the story of the struggles, victor I am a book snob. I admit it. I rip apart verbage, punctuation, pace, character arcs, you name it. I am critical. Mark's wife, Giulia, has her first psychotic break shortly after they are married. He shares the story of the struggles, victories, heartbreaks, and every other roller coaster of emotion they experience. And he doesn't pull punches. Speaking from a place of professionalism and personal experience, this is one of the truest books and bravest books I've read. I am a psychiatric nurse. Additionally, my family has a rampant history of mental illness, both in my immediate and married family. He described the emotions and struggles of supporting a mentally ill loved one perfectly. These are the stories that will help defeat the stigma still wrapped around mental health. Terrifying. Yes. Loving and personal. Also yes. The writing was raw. They didn't do everything right. No one does. They weren't perfect. They struggled, fought, and figured it out. But that's real. The book managed to pair the dark reality of mental illness with humor and heart warming moments that offered hope. I cringed when he described the first unit Giulia was ever admitted to. What a hot mess. Granted, being it was her first experience in a psychiatric unit, fear of the unknown probably colored their perspective as well. But yikes. I cringed. Please, God, let that experience never happen to our patients. My biggest critique for this book didn't come from the "story" or the "writing style." I felt a little frightened when he started talking about "antipsychiatry." I was thinking, "Please don't go there; please don't go there." BUT it pulled out of a nose dive and he actually described them going through a process I'm heavily in favor of. He called it "mad mapping" (a term I've never heard prior to this book). We actually call it a mental health advance directive and strongly encourage all our patients to plan it out when they are at their baseline. So my critique isn't actually a critique at all. Just professional musing. Who should read this? Everybody. Absolutely everybody. Professionals- as a reminder of the perspective from the other side. The minute we lose our empathy and love for what we do, we need to quit. There is no room for impatient, bitter mental health providers in any unit. Family of those supporting a person with mental illness- you're not alone. This book is a comfort and pays homage to the courageous battle we fight every day. Those with mental illness- your battle is seen! Not only that, but it's enlightening to see the persective of a caregiver who questions their role in the health of their loved one. And maybe most importantly- the few people out there blessed enough to not have a clue. With the utmost respect, many of the comments I've seen for this book tell me who is blessed enough to still be naive to the reality of psychiatric units, sleepless nights with loved ones, need for FMLA, the list goes on and on. No one can hold that against anyone: you don't know what you don't know. But it's so important to recognize our knowledge gaps. This book is important. Consider picking it up. I can vouch for the reality of everything written. From the psychiatric units and medications to the marital issues and stressors they faced. Giulia grew intolerably frustrated by our inability to understand her. She rolled onto her back, pulled her knees toward her chest, and chanted, “Voglio morire, voglio morire, voglio morire.” I want to die, I want to die, I want to die. At first she hissed through her teeth, then started shouting, “VOGLIO MORIRE, VOGLIO MORIRE, VOGLIO MORIRE!” in an aggressive roar. I'm not sure which scared me more: listening to my wife whisper her death wish or scream it. As author Mark Lukach concludes at the end of My Lovely Wife in the Psych Ward, he does sound like he has lived “a charmed life” – a childhood of love and adventure, mutual love at first sight with the woman he would eventually marry, professional fulfillment – so while he's describing the harrowing circumstances around his wife's recurring psychosis, I couldn't help but think, “This is awful, but it could be worse”. And despite having worked as a freelance writer and enjoying success with articles in major publications, I didn't find this to be an incredibly well-written memoir – the emotion is flat, the timeline rushed, no research is added for understanding – so I couldn't help but think, “This is okay, but it could be better.” Yet, as someone who has had no contact with the mental health system, I am grateful that Lukach decided to share his story: his might not be a typical life, but this memoir has the sheen of a truthful account; a worthwhile addition to the record of human experience. The book opens with Lukach's fairytale romance with future wife Giulia – a beautiful, gregarious, and focussed Italian-born fellow-Freshman at college. They eventually marry, move to San Francisco, and begin their working careers: he as a teacher, she as a marketing manager. They have dinner parties and long walks on the beach, get a dog, and plot their happily-ever-after. And then Giulia becomes overwhelmed with work, can't sleep, and begins to have hallucinations about talking with God. When the sleepless nights continue, Giulia becomes terrified that she's now talking to the Devil, and as Lukach has no idea what else to do, he brings his wife to the ER against her will and consents to admitting her to the psych ward. Lukach is brutally honest about this experience: His uncertainty and fears, the cold bureaucracy he confronts with the health professionals, the toll this experience takes on him personally. When medication eventually allows Giulia to be released (after 23 days), she then sinks into an eight month long depression; wishing every day for death. Lukach pulls her out of that, too, and despite neither of them having worked for nearly a year, they have enough money saved to be able to go on a four month, round-the-world vacation; rediscovering their love and commitment. Giulia feels so good at this point that they decide the breakdown was a one-time occurrence, and they have a baby. Not long after Jonas is born, Giulia begins to have delusions again; this time Lukach doesn't hesitate – he brings his wife to the ER and demands admittance to the psych ward. After an even longer stay this time, Giulia is again released and again suffers months of suicidal depression – all while her husband does his best to take care of the baby and the house and his sick wife. As he is not taking very good care of himself, friends intervene and one hands him The Divided Self: An Existential Study in Sanity and Madness: an “antipsychiatry” book that advocates for less medical intervention for the mentally ill. And while Lukach is eventually interested in what this book might offer him and his family, he really doesn't go into it far enough for my satisfaction. He and Giulia do make a “mad map” – Giulia is able to predetermine what care she is willing to endure in the event of further breakdowns (which totally makes sense: allowing someone to make decisions, while healthy and in concert with a psychiatrist, about her own future) – but when Giulia did have another episode, she was no longer willing to take the medications that, when healthy, she knew she would need; no longer understood why she couldn't have her two-and-a-half-year-old son visit her in a care facility. I felt trapped by the impossibility of the situation. I didn't trust Giulia to make her own decisions. I wanted to make them for her, which led to her resenting me for not trusting her. I didn't want Giulia to resent me, but the only way to do that would be to allow her to make her own decisions, even if that included choices that could hurt or even kill her. It wasn't going to work if I remained in charge, and it would be too risky if she was in charge. What was most interesting was Kuhach's evolution as a caregiver: Everything was unknown during the first episode, he had a false confidence that he was an experienced decision-maker the second time, and by the third, he was willing to back off and let the professionals do their jobs. He never stopped advocating for Giulia, and he continued to visit her every day that he could, but he eventually understood that he would need to put Jonas and himself first. On the other hand, it was hard not to recognise that this is a family of inordinate privilege: They could go long stretches without working; her mother routinely flew in from Italy, and his from Japan, whenever needed; we're supposed to feel bad that Kukich has to give up frequent surfing for trail running. I was annoyed that their local coffee shop became hip for its selection of artisanal toasts, and I was shocked when Kukich concluded (after the suicide of one of Giulia's friends from the psych ward) that killing oneself is simply another kind of courage. He voices his frustration that prescribing medicines for the mentally ill is an imprecise science – Giulia seems to be forever over- or undermedicated while finding the right dosage – but it's obvious from their experience that they need to trust the process; Giulia needs medication, no matter its side-effects or the opinions of the antipsychiatry movement. Ultimately, like I said in the beginning, this was an interesting experience for me to read about, even if I didn't think it was as well-written as it could have been. I wish the Kukichs all the best. Yikes. This was really closer to one star, but I've noticed that other reviewers who give this book less-than-stellar ratings get harrassed, so I'm...hedging my review a tiny bit. I spent this book alternating between bafflement and a kind of low-grade rage fever. I am baffled by other readers who feel this has "searing honesty" and "raw pain" and "deep introspection"--it felt a mile wide and an inch deep. It's so painfully clear that the author has never, once, in his entire life, been told "no, Yikes. This was really closer to one star, but I've noticed that other reviewers who give this book less-than-stellar ratings get harrassed, so I'm...hedging my review a tiny bit. I spent this book alternating between bafflement and a kind of low-grade rage fever. I am baffled by other readers who feel this has "searing honesty" and "raw pain" and "deep introspection"--it felt a mile wide and an inch deep. It's so painfully clear that the author has never, once, in his entire life, been told "no," in any context or situation, no matter how innocuous. Lukach feels like That Guy who goes to a restaurant that has a big sign saying "No dogs, please" and always brings HIS dog, because...he's That Guy. For just one example, his utter bafflement when a nurse tells him to come back during visiting hours--his constant attempts to explain to the nurse that those rules simply do not apply to HIM--are exhausting to read. This, for me, is exacerbated by the enormous privilege he and his wife share. I mean, that's great for them, but to never once admit or examine or acknowledge that they are truly the 1% is teeth-grindingly annoying. --While they spend a year with zero income, they fly to New York one week, Japan the next, and then take a four-month vacation around the world. I mean...again, great, for them, but to pretend like this is just normal things that are available to everyone is...a level of willful blindness that enrages me, especially when I think of people I know, and people I don't, who deal with the same illness Guilia does with not one tiny percent of a percent of the money or help they have at their fingertips without any hesitation or fear at all. I wanted so much to like this book, or learn from this book, but it's like reading about aliens. No doubt they all suffered terribly. But they will always, always, always have a cushion that millions of other people suffering just as much will never have. The courage it must’ve taken this man to write this book and then let the world read about it is really astounding to me. I read, in detail, this entire novel that described his wife’s episodes of psychosis and depression, the shift of her personality before and after, and I have to say, I felt it. It was visceral. The astounding thing about that is the knowledge that my feelings of confusion and desperation and frenzy (among other things) don’t even come close to what dealing with it firsthand The courage it must’ve taken this man to write this book and then let the world read about it is really astounding to me. I read, in detail, this entire novel that described his wife’s episodes of psychosis and depression, the shift of her personality before and after, and I have to say, I felt it. It was visceral. The astounding thing about that is the knowledge that my feelings of confusion and desperation and frenzy (among other things) don’t even come close to what dealing with it firsthand must have felt like. I don’t think I can even begin to comprehend it. And the same can be said for the feelings of desperation, frustration and utter helplessness that Guilia must have felt. I flew through this book not only because of the content, but because the writing style was very easy to read. It was detailed and in-depth and didn’t leave me with too many unanswered questions. The ending was not a great conclusion to the story, but I imagine that’s because their story isn’t over. My first reaction to this book: WOW. I loved it… or as much as one can love a book about mental illness and difficult subjects, which is a lot even if it’s sometimes hard to read. Mark and Giulia were leading a “charmed” life with a beautiful love story. They had recently moved to San Francisco and were settling into married life and careers when, at the age of 27, Giulia inexplicably and out of nowhere suffered a psychotic break. Recovery was long and painful after a month long stint in the loca My first reaction to this book: WOW. I loved it… or as much as one can love a book about mental illness and difficult subjects, which is a lot even if it’s sometimes hard to read. Mark and Giulia were leading a “charmed” life with a beautiful love story. They had recently moved to San Francisco and were settling into married life and careers when, at the age of 27, Giulia inexplicably and out of nowhere suffered a psychotic break. Recovery was long and painful after a month long stint in the local psych ward. The marriage they once knew was gone, and in its place, pieces that would need to be rebuilt. Eventually, after a full recovery, things seemed to be back to normal until a second breakdown after having their son, and another one after that. Mental illness is tough. It’s hard to talk about, hard to admit to. But this memoir? This memoir, you guys… brutally honest, uncomfortably real. I cringed and I soared and I recoiled in horror right alongside this amazing young couple. The thing about mental illness is that it doesn’t preclude anyone. No one is immune. It offers no explanations, no sympathy, no nothing. For Giulia, one day it wasn’t and the next day it was. I was pulled into her story and Mark’s story and I couldn’t read fast enough. I mean, really. This book read faster to me than some of the craziest suspense novels I’ve ever read because I was just fascinated by their story and hoping and praying and waiting for the end result to be good. When I wasn’t reading it, I was thinking about it. I know mental illness is so personal but I love that Mark and Giulia let us into their story, the highs and lows, the fights, the tears, the frustration… all of it, no holds barred. I love how open and honest and thorough Mark is in describing their experience, and how it is to love someone with mental illness. I love that Mark isn’t afraid to show us that it’s HARD to love someone with mental illness, but that you can love them just the same. I love that he shows us vulnerability, anger, resentment, fear – the times he lost his temper along with the times he was nearly a saint (though I doubt he’d call himself that!). I love that they’re sharing their story because somebody somewhere will read this and say “aha! Me too! I’m not alone!” Oh and also? There’s a Bulldog so… instant love right there, you know. I’ve had anxiety and depression for most of my life, and while my issues are not nearly as severe as those depicted in this memoir, I feel grateful anytime people are willing to open up about their experiences with mental illness. It’s a relief to know that someone gets it, that there are people out there who SEE that these are real illnesses, despite not being able to physically see them. You can look fine and yet not feel fine. This book was well written and really took you through the experience of being a family member of someone with mental illness episodes that take over your life at times. I found it rather gripping and read it at one go. Author Mark Lukach met his wife Giulia when they were teenagers, they married and moved to San Francisco and life was looking good when they were blindsided by a psychotic episode that turned their world upside down. This was an enlightening read that was very honestly done. Memoirs are, in general, not easy to write. But, books like My Lovely Wife in the Psych Ward are not just difficult to write, but are also heartbreaking and difficult to read. Mark Lukach provides an account of his journey and experiences, after his wife develops a mental situation, which relapses multiple times. He shares his feelings, frustrations, stressfulness, limitations and also the lovely, memorable and hopeful moments. The major takeaway from this memoir is "It's worth it." It's worth it Memoirs are, in general, not easy to write. But, books like My Lovely Wife in the Psych Ward are not just difficult to write, but are also heartbreaking and difficult to read. The major takeaway from this memoir is "It's worth it." It's worth it to go through all this pain, stress, hurt, uncertainty and frustration, because it's for your loved one. And also, they may not able to say it out loud, but your loved one is counting on you to stand by and be of support during these difficult times. It does feel few times that the perspective of the loved one (in this case, the wife) is missing, but then that's not the purpose of this book. This is a memoir by a loved one (the husband) living with a family member who is going through a tough mental health situation. There is a need to spread awareness and voice out different perspectives and views on mental health situations. This book does serve that purpose. This is a memoir written by a non-author and it seemed clunky and almost like a diary format. This book is supposed to illustrate the struggles one faces when suffering mental illness, and it does to a point. The main focus is on how crappy everything is for ill person's husband, the author. We get it, it's hard. But, he has a ridiculously accommodating support system, hardly works, and complains about everything! His wife was grumpy. She didn't say "Thank you." His mother in law wants to cook to This is a memoir written by a non-author and it seemed clunky and almost like a diary format. This book was painfully beautiful. I loved it all, my copy is so marked up with notes and tabs on the pages. I only hope to be loved in this life the way Mark loves Giulia. A heart catching read about love, family, and mental health. I have always dealt with a bit of depression, my whole life. Right after Olivia it was at its absolute worst, and it was the first time that I felt like I had to medicate myself. I felt shame and absolute humiliation. After about eight months I felt nothing at all so I wanted to get off of them so I just stopped. About a year later our marriage hit a major bump in the road and I thought for sure we were getting a divorce but the day I went to file I found out I was pregnant, so there I was, my h I have always dealt with a bit of depression, my whole life. Right after Olivia it was at its absolute worst, and it was the first time that I felt like I had to medicate myself. I felt shame and absolute humiliation. After about eight months I felt nothing at all so I wanted to get off of them so I just stopped. About a year later our marriage hit a major bump in the road and I thought for sure we were getting a divorce but the day I went to file I found out I was pregnant, so there I was, my husband was jobless, I was pregnant with an almost two year old, and I had divorce papers in hand, cue mental break down. So I was put back on an anti-depressant that was safe for pregnancy. I cried all of the time but I felt nothing at all so I don't know how helpful it was. As soon as I could get off of it, I did. I went several years with no medication, I had bouts of feeling down, but I managed it with diet and exercise. I tried to fill my schedule with fun things so I didn't give myself the time to go into the hole. There were many parts that I really liked in this book, the story is mostly terrifying. A woman, maybe one that tend to be much more stressed than the average person, one day loses her sanity completely. Giulia grew intolerably frustrated by our inability to understand her. She rolled onto her back, pulled her knees toward her chest, and chanted, “Voglio morire, voglio morire, voglio morire.” I want to die, I want to die, I want to die. At first she hissed through her teeth, then she started sho There were many parts that I really liked in this book, the story is mostly terrifying. A woman, maybe one that tend to be much more stressed than the average person, one day loses her sanity completely. Giulia grew intolerably frustrated by our inability to understand her. She rolled onto her back, pulled her knees toward her chest, and chanted, “Voglio morire, voglio morire, voglio morire.” I want to die, I want to die, I want to die. At first she hissed through her teeth, then she started shouting, “VOGLIO MORIRE, VOGLIO MORIRE!” in an aggressive roar. I am a bit torn about Mark, our story teller. He is a martyr, sacrificing so much. But he is describing himself at the center of this. And at some point he even admits it. He even has a small breakdown around it. It bothered me at some point how much it was about him. Even the name of the book, "my lovely wife", is a bit bothering. We don't even know anything about Giulia, except that she has mental illness. To start with, Guilia and Mark got together and got married, too immature as the story goes. They were in love, sure, but they didn't know each other at all, and both were young and careless and knew almost nothing about themselves or each other. That makes it much harder to go through crisis times together. That maybe also explains some of Mark's coping with the tough situation. And of course, Mark's position is tough, close to impossible. His wife is losing it. And he is not even allowed to see her medical reports (since she didn't approve this). He is trying to be supportive, and his wife seems to get out of the psych award way before she is normal again. Now he is spending much time with her parents, and everyone is in a giant pressure cooker. Later on, after she gets back to normal in the same abrupt way like she got in to it. They hope she is not one of the 90%. Ninety percent of the time psychosis recurs. She is part of the ninety percent. And it is even harder when they decide to bring a baby to the world, and his mom needs to take drugs regularly. The book got a bit repetitive at some point with all the in and out of the hospital. And it could be better edited. But really, the main thing would be to edit Mark's self centered world view. I loved the preparation that they did after the second or third time. They agreed on the terms of what to do if Giulia's situation seem to be an event of relapse. They went a long way, made tough decisions, and tried to make it happen when relapse happened. That's the main reason that this book is not just 3 stars but closer to 4. One thing that I really didn't like is Mark emphasizing again and again to how their son Jonas prefers him to Julia, and gets more attention from him than Julia. Some of that is "necessary" for the story, but some of that just seem like his need to talk about himself. Guilia is the working parent in their household, he decided to be a stay-at-home dad (but complained about it in abundance. btw, no one has to do this, there are daycares in the world). And when Guilia is sick, it is hard to blame her of not being attentive to any of them. Almost 4 stars. because it is an enchanting topic, and the pre-agreement of how to take care of relapses sounds worth spreading (and not only in sickness situations). Mark himself gets only 2 stars from me. I found this one to be a really fascinating, sad, eye-opening memoir. I've always had a little bit of a fascination with mental illness and how people cope with it in their lives, if they ever do. This book is ultimately both a memoir and an autobiography. In the book, the author talks about his relationship with his wife, how he coped with his wife's sudden onset of mental illness and the struggles that he went through. This is the memoir part. But then the author also focuses on his wife, how she coped, what the diagnosis did to her and how she acted and reacted. That is the autobiography part. Although I felt extremely sorry for Giulia and her bipolar diagnosis, which must have been devastating, the person that I felt most sorry for when reading this true account, was Giulia's husband and the author of this book, Mark. I cannot even vaguely begin to imagine what it must be like to see the person that you love crumbling before your eyes. Giulia become unloving, rude, withdrawn, selfish and all these things were aimed at her husband Mark, who was just trying to remain a rock and a constant support. And of course I realize that Giulia didn't have any control over her emotions, or over how she treated Mark, but I couldn't help feel incredibly sorry for him and a little bit irritated with her. I must also mention at this stage, that I found this account to be incredibly honest, and I must applaud Giulia for this as I'm sure she needed to agree to Mark including some of the scenes that he included in the book. For example, there is a scene where Giulia has been released from hospital and she is back at home and Mark asks her to do the dishes after dinner. She is in her room, lying in bed and says no, she doesn't want to do them and he must do them. It's a scene that got my blood boiling because Mark had basically given up his whole life for months and months, he had done everything for Giulia and had looked after her constantly, and she couldn't even do the dishes! This is just one example of a small scene that could have been left out of the book, but wasn't. It's such a normal, every day thing, but yet it was included in the book and it was honest and brutal. Overall, this was a really great read. It's always difficult to rate a memoir / autobiography because it's always difficult to rate someone's real life experiences. I do try and remember that the pacing will be different to a fiction novel, as will the gripping nature of the read. But this one was great. It was incredibly interesting and eye-opening, it was sad but also hopeful. The love that Mark shows for Giulia is incredible and amazing. My personal feeling is that I'm not quite as confident that Giulia shows the same depth of love for Mark, but that's just my personal feeling. This is a wonderful memoir that I'm sure many people will "enjoy" (it's difficult to say enjoy due to the nature of the read). I'm sure that many of you will find something in this read to lift your spirits. I know that I did. And here's wishing all the best to both Mark and Giulia, for their life together. I wanted to like this one, really. But I found it to be a bit too much "bubbly" at the beginning, which it also was very fast moving because they presented us the main characters which went from unkowns to married in no time. I guess the author wanted that part introduced and done with so we could settle for the rest of the book, but too me it seemed a bit to fast. Be aware that this is a very difficult book to read if you suffer from any type of panic or anxiety disorder. Mark knew he was in love with Giulia the first day he laid eyes on her. Young at eighteen, he knew that there was no other person he will rather spend his life with. Giulia was the love of his life, she was beautiful, smart and the two of them were blissfully happy together. There is nothing he will do without her, she was the life of his party and his heart. While the two of them had separate lives work wise, they still were connected intimately, never fearing that they would ever part ways. Ho Mark knew he was in love with Giulia the first day he laid eyes on her. Young at eighteen, he knew that there was no other person he will rather spend his life with. Giulia was the love of his life, she was beautiful, smart and the two of them were blissfully happy together. There is nothing he will do without her, she was the life of his party and his heart. While the two of them had separate lives work wise, they still were connected intimately, never fearing that they would ever part ways. However when Giulia behaves irrationally, he wonders his wife mental state. All a sudden Giulia starts hallucinating, thinking that there are demons out to get her. Often saying that she is not fit to live and starts to make up things that are not true at all. Mark tries to convince her that it is all in her head, but it only gets worse. Beyond his comprehension, he tries to assure her that he loves her and nothing will ever separate them. Yet she starts talking about death and how he will be so much better without her, thus Mark takes her to a psych Ward. Peers around him want him to stay strong for her, but he is losing hope. Giulia progress gets better but then she starts behaving irrational again, thus he must decide whether to put his life on hold to care of the woman that loves. Through thick and thin, this is a touching and deeply emotional novel about mental illness, ultimately a story about love that has no barriers. I know a little about mental issues, but this book expanded my knowledge about facts that I was not familiar with. Regarding the content, this memoir was so hard to read. The love Mark had for his wife was remarkable, it had me in tears reading some chapters. Mark never gave up on them even when he went threw tantrums, he loved her so much. I felt like the two of them had the perfect fairy tale relationship. Even when the book opened up, the way he described her was so romantic, man I was gushing hard... Hey what can say I am a hopeless romantic. By far the best memoir I read this year, it was deeply evocative and sentimental. This is an amazing book , so full of love, commitment and hope. It a must read, even if you do not know anyone going through this in their life.